Chicago-based photographer Ivette Ivens campaigns for extended breastfeeding with a powerful photo series titled "I Breastfeed My Toddler". Here are some highlights. Mother-in-laws and naysayers have been raising an eyebrow to extended breastfeeding since, like, forever—and after that Time magazine cover, the conversation has become even more heated. But as nursing advocates (and celebs like Mayim Bialik and Alyssa Milano) continue to stand-up for the right to feed our babes until they're ready to stop, there's hope for any negative stereotype to be lifted. Chicago-based photographer Ivette Ivens is one of the many people making waves in the world of extended breastfeeding with a powerful photo series titled "I Breastfeed My Toddler," which depicts women intimately feeding their babies. The inspiration behind her series, Ivens says, comes from her own experience. The 25-year-old breasfed her older son until he was more than 3-years-old, and is currently continuing with her 8-month-old. "I am trying to live as nature intended in many ways, and breastfeeding is one of them," she told FitPregnancy.com. "However, I had to learn that there are a lot of ignorant people in the world. I don't blame them, they don't have the knowledge or never went through this. I'm just trying to find a beautiful way to go back to the roots, and to show what mother's inner voice tells her while she's breastfeeding." 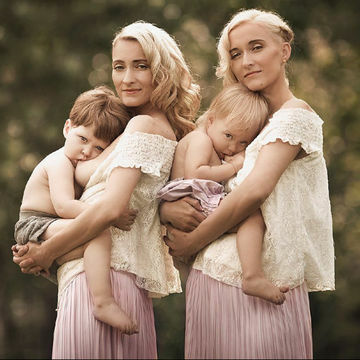 In her series, which she describes as "very goddessy," women are photographed while sharing a moment with their children, ranging in age from infants to nearly four years old. With this project, she hopes that women will be able to not only be themselves and be the mothers they want to be, but that all women will have the right to breastfeed anywhere and anytime. Check out some of our favorite photos from the series below. Her book, Breastfeeding Goddesses will come out in mid-November this year, and can be pre-ordered here.